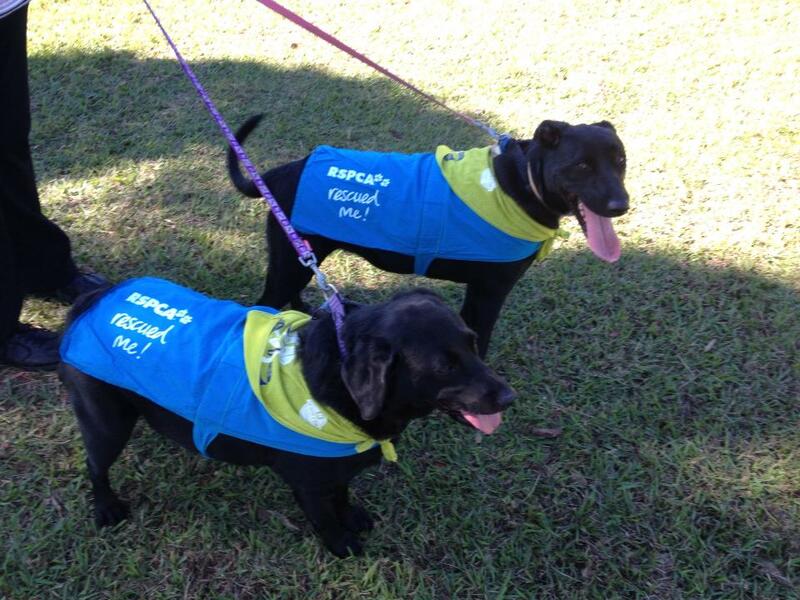 Our “girls”, Layla and Jasmine, bedecked in their Black Tag vests, were well behaved for their 4km Million Paws Walk at 7th Brigade Park at Chermside. SOME people baulk at the thought of adopting a “rescued” dog from a shelter, but our family has two of them and we couldn’t be happier. We’ve almost always had dogs and, having lost our beloved 16-year-old Labrador-cross Banjo a year or so earlier (to the ravages of old age), our family decided in early 2010 to look for another four-legged friend to help keep the king of the household on his toes – that would be Puska, an aging, regal but somewhat lonely Burmese male cat. Having had a wonderful experience with a dog adopted from a shelter a couple of decades earlier, our resolve firmed when we saw a news story about homes needed for puppies born to dogs that had been earlier seized from a “puppy mill” at Wondai, north-west of Brisbane. The RSPCA typically classifies dogs that have been seized by their inspectors for one reason or another as Black Tag dogs. Some will have been cruelty cases, some will have been seized from puppy mills or pet hoarders, while others will have been abandoned, neglected, badly treated or abused. In Layla’s case, she was seized while still in vitro (she was born at Fairfield RSPCA after her pregnant mother was seized along with more than 400 other dogs from that Wondai puppy mill). Within moments of meeting her, Layla had adopted us and we, too, were smitten. She was six months of age and had been cared for by a foster family on behalf of the RSPCA until she was old enough to be desexed and put up for adoption. Her foster family had done an excellent job of basic training and we were delighted to take her home and begin her integration into our household. Her bowl says “princess” and it so suits Layla, our beloved black Labrador. Layla’s technically a small, black, purebred Labrador (in that her legs aren’t that long) but her coat is ever so slightly brown in bright sunlight. She’s an excellent retriever, so bringing the paper in from the front lawn is a daily delight for her and for us watching as she bounds out and races back with her quarry. 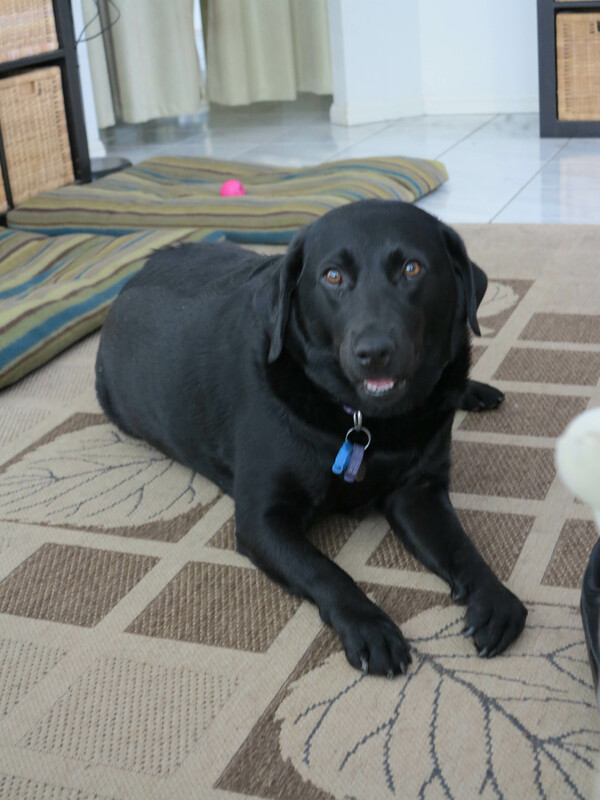 And, of course, being a Lab, she just loves her food and any treats she can cadge. With her liquid brown eyes she has the most wonderful, loving nature and is a great companion for the whole family, Puska included. After six months or so, we started thinking she really needed a playmate who was more her own size. However, Brisbane’s flood disaster initially intervened and, while we were not directly affected, it kept our household fairly busy throughout the early weeks of 2011. The RSPCA’s Fairfield shelter itself had sustained heavy damage in the floods was shut for over a month, but all of their animal charges were safe in the care of foster families dotted across the city. The day the shelter reopened a call was put out to rehouse hundreds of these animals so we took Layla with us when we went back to see if we could adopt a companion for her. In the case of one black, cross-breed puppy, an RSPCA carer told us, it had been only months old when found wandering the streets with its mother during the January floods and was immediately sent to a foster family while the shelter was rebuilt. And, with hundreds of animals needing rehousing when they reopened in mid-February, there was understandably a fair bit of confusion. By then desexed and about five months old, the puppy was actually in a kennel with a sign saying Bull Mastiff x Staffordshire Terrier and sporting a boy dog’s name (Montague Esquire) … both were well wide of the mark. Now fully grown, we are fairly sure Jasmine, a desexed female, is a Bull Arab x Cattle Dog (with possibly a touch of Doberman for good measure), given her much narrower head and jaw, her speckled grey chest and a strong, muscular but mid-sized conformation. Jasmine with Squid, one of her many toys. Having been a “street dog”, Jasmine remains fairly timid and has a tendency to wolf down her food, so we usually feed her in two smaller takes. But she’s intelligent, (mostly) obedient and, like her big sister Layla, learns quickly. However, as soon as she’s had her night feed and been out to the ‘loo, Jasmine falls into the deepest sleep, unlike Layla who is a far more of a night owl who won’t settle until the humans have. The two dogs have become inseparable. When we walk them, if we take two leads – and not their conjoined one – and we happen to walk them a few metres apart for some reason, they immediately worry where the other one is and will begin to whimper. 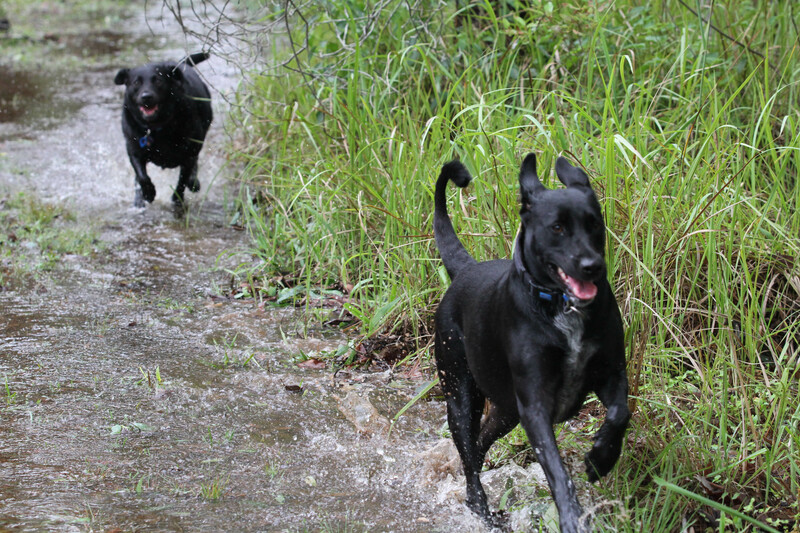 After a typical Brisbane downpour, Jasmine and Layla race through the shallow overland stream behind our house. They wrestle, play chasey, romp together through shallow water and love nothing more than a trip to the dog park where they romp through the obstacle course and meet up with other four-legged friends. 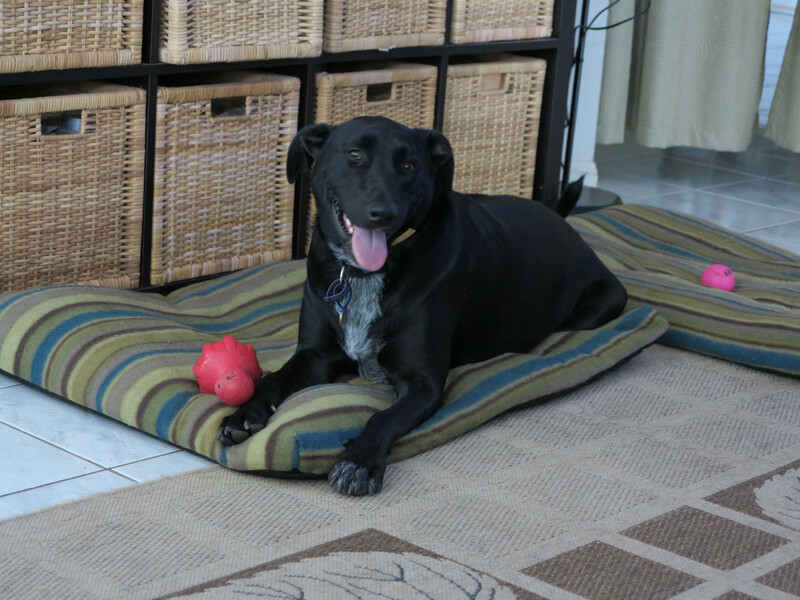 They’ve both had their “oops” moments, mostly as younger dogs, but they have matured to be truly lovely pets. 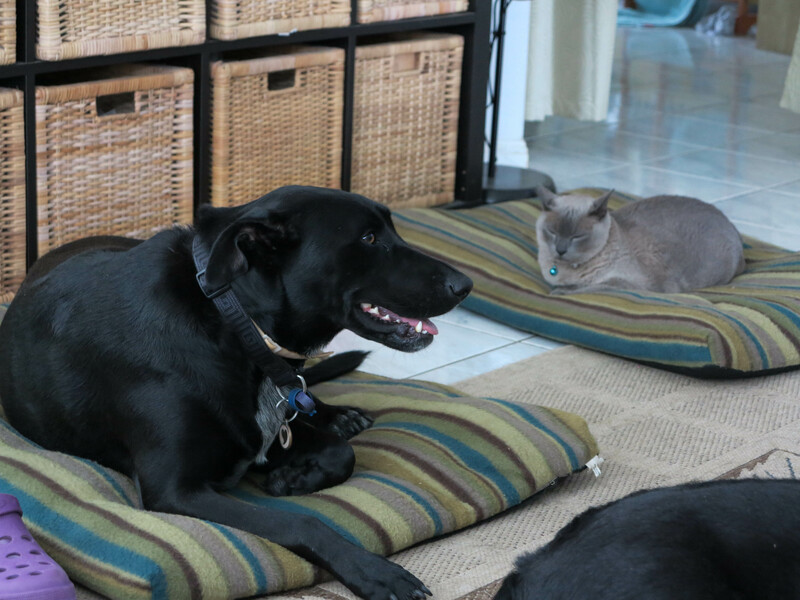 And even Puska – who still rules the roost – has come around to snuggling up to one or other of them on a cold night or grabbing a warm dog bed just vacated during the daytime. The girls know their place and respect his status as head of the livestock household, with all three getting along famously. Jasmine on one dog bed with Puska on the other. So last Sunday’s Million Paws Walk was the ideal time to show the good folk at the RSPCA just how far the pair of them had come. 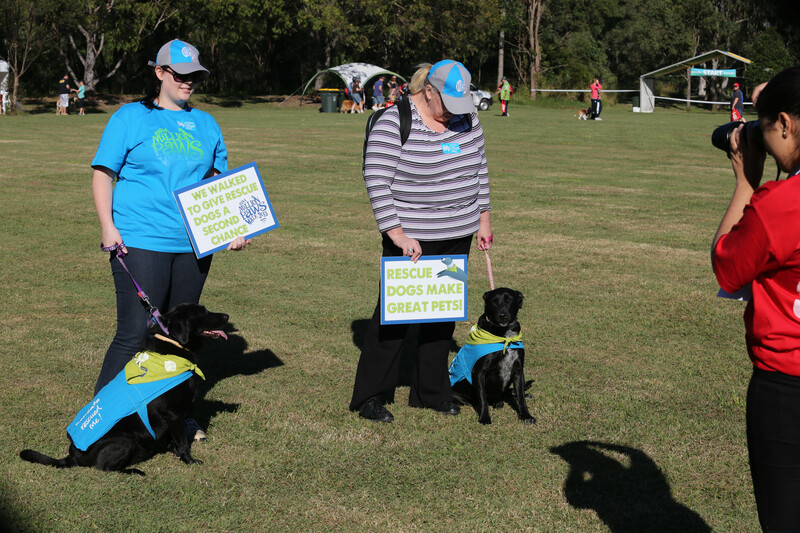 With both of our girls being classified “Black Tag” dogs, and given bright blue vests saying “RSPCA rescued me” to wear during the walk, they led off thousands of other happy dogs and their owners who tackled with a 1.5km or 4km walk. We did the longer walk at quite a quick clip and had two tired but happy girls afterwards. The girls get their pictures taken at the Million Paws Walk. So, if your household is weighing up whether to adopt a pet from a shelter, know that you will be giving a home to a deserving animal that might have had a tough start but who will open their hearts up to the love that you have to give. 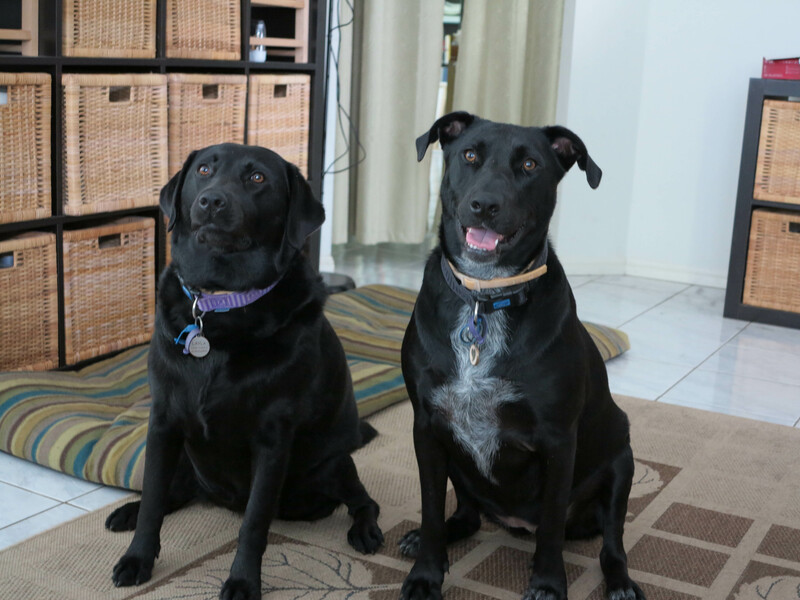 Our RSPCA “Black Tag” babies … Layla and Jasmine.